Ethics, in a broad sense of the word, is difficult to define. Personal ethics tend to vary greatly from person to person, however, each industry has a generally accepted, if not published, code of ethics. Infusing ethics throughout your business matters because it reflects both the beliefs your organization holds and on you personally. Marketing research is such a ubiquitous function that it applies to the business, philanthropy, and academic worlds. For this reason, there are different codes of ethics for different types of marketing and research, such as social media marketing, marketing towards children, and public opinion polling. Research is a large part of a successful marketing strategy. To market effectively, you should know your target audience, what they need or want, and the best means to reach potential clients. All of these require thoughtful, informed, and ethical research. Unfortunately, research is often manipulated or falsified because it holds so much power to influence. We’ve all seen the stories on the news of faux market research (Crystal Pepsi, New Coke, the Ford Edsel, etc.) Falsified research can result in product recalls, misleading claims for investors, and threats to the safety of users. DO respect the rights of all research participants: confidentiality, transparency, and privacy. Ensure that all participants are voluntary, and that they have the right to withdraw their consent at any point during the research process. Respondents must also be informed if they are being filmed or recorded. DO establish with the firm you have hired to conduct the research that they are conducting it in your best interest, not theirs—that is, that the research being run is of no benefit to their personal or firm interests. It is best to come to an agreement about the means of research and the cost of the research before anything is begun. DO be sure to cite the name of the firm that conducted the research, the purpose, and the dates of the study in any reports. Through transparency, you’ll show your viewers that your research is trustworthy, and that the strategies you used were effective. DON’T cite any research in which the responses have been influenced or coerced. This is junk research and use of it is ultimately ineffective for promoting your organization or product. DON’T ask the researchers for confidential information about the respondents or their responses. DON’T dictate the methods used by the firm you’ve hired to conduct the research — leave it to the research professionals — but they should explain the 'why' of their recommendation. DON’T ask for quantitative analytics from a qualitative study, and vice versa. If you need a certain kind of data, make sure the study is done in a way whereas the results are useful for your organization and purposes. DON’T conduct primary research (new data) when you can purchase the results of a secondary study (already collected data) with the same purpose for much cheaper. Why pay for a costly survey or focus group when someone else has already done something with the needed results? 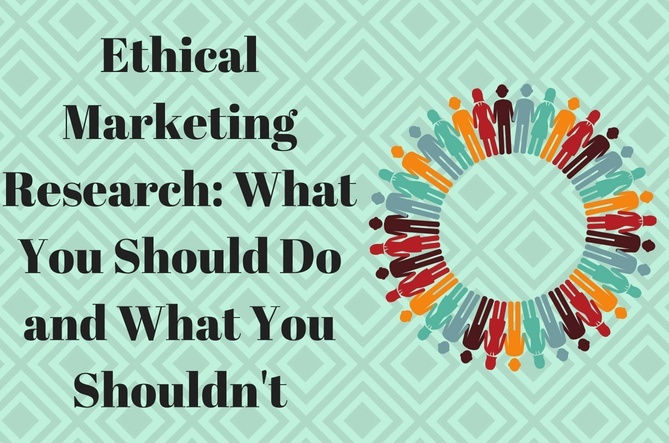 What Do Marketing Research Ethics Mean for Your Business? As you can see, there are a lot of different ways marketing research can go wrong. Without a clear code of ethics, a mission-driven business could sponsor a focus group or other research project that can end up seriously harming them and their customers. Unfortunately, it happens all the time: the public catches wind of a suspicious business, said business is immediately denounced by many previous clients, and the business loses credibility, which can be difficult or even impossible to recover from. Ethical practices in marketing research will create effective answers for your organization’s questions and build trust and credibility with your employees, clients, and stakeholders. A mission-driven, win-win approach! Katie Sheets is a rising senior and English major at the University of Vermont. Originally from Connecticut, she hopes to use her love for language and writing to help other mission-driven businesses in the future.